Canvas @ YaleInstructor Guides GradesHow do I submit audio/video feedback to a student? NOTE: To submit audio feedback, you will need to have a microphone. 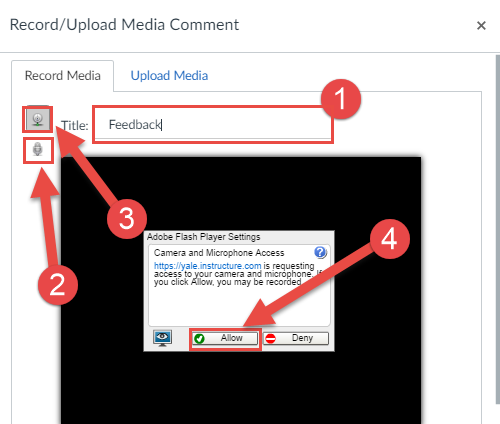 To submit video feedback, you will need both a microphone and a webcam. Go to the "Assignments" area. 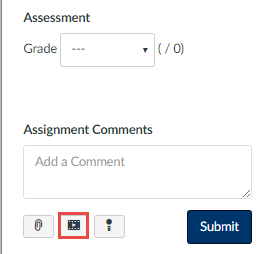 Find the assignment where you would like to give audio/video feedback and click on it. Click on the "Speedgrader" link. Once inside SpeedGrader, look to the right side grading panel. 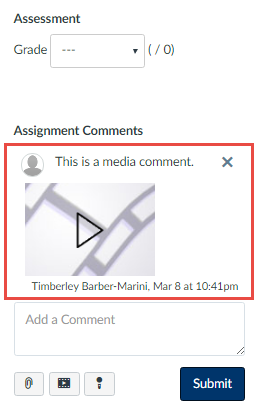 Under the "Assignment Comments" text box, click the media recording icon. A pop-up window will appear. In the pop-up window you will see two options. 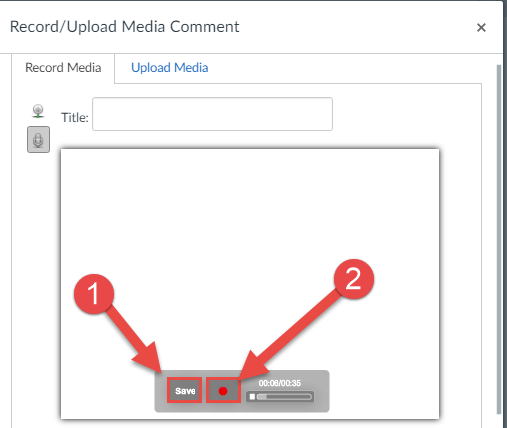 You can either select the "Upload Media" tab to upload a file that you have already recorded or you can create a new recording by selecting the "Record Media" tab (this tab is selected by default). If you choose to record your own media, select the "Record Media" tab. Enter in a title for your recording in the "Title" box . Then, on the left, you can choose to record audio only  or you can choose to record audio and video . Once you have selected the appropriate option, click the "Allow" button  in the Adobe Flash Player Settings pop-up. When you are ready to begin recording, just click anywhere in the box. When you are done recording, just click again in the box. Note: If you are recording audio & video, you should see a preview of your webcam image while you record. When you are done recording, the recording will automatically play back for you to review. If you are happy with the recording click the "Save" button  or you can click the record button to re-record . 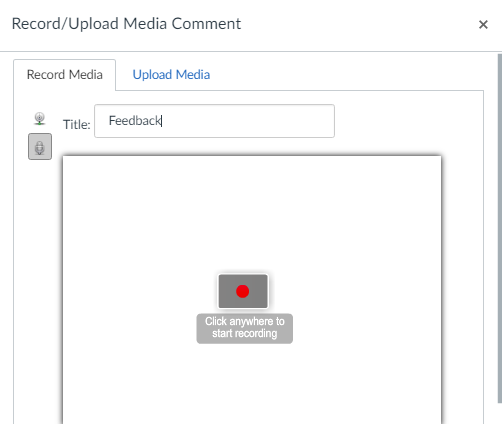 When you are done, the media recording feedback will appear in the right side grading panel in SpeedGrader.